Detail from the cover of “Bayanihan and Belonging,” a new book from Dr. Alison Marshall exploring the Filipino-Canadian experience. 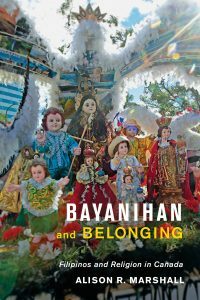 A new book by Brandon University professor Dr. Alison Marshall is the first of its kind: “Bayanihan and Belonging” (University of Toronto Press, 2018) explores the experience of Filipino people in Canada, paying special attention to the importance of religion and belief as well as migration. As a result of this publication, Dr. Marshall has been in demand as a speaker on the topic, with a well-attended and well-received talk on April 5 at Simon Fraser University. She is planning a Manitoba book launch for May 8 at McNally Robinson in Winnipeg. 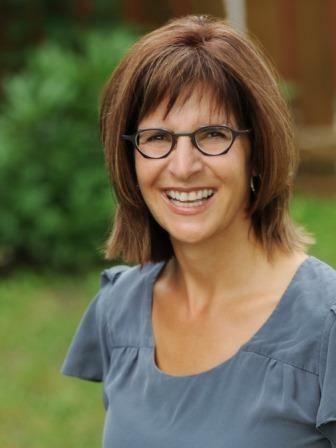 Dr. Alison Marshall has extensively studied the link between religion and migration. Drawing on extensive research among the Filipino community in Canada, Dr. Marshall’s new book details how many Filipino people who migrated to Canada continue to define themselves religiously. At other times, she explains, these hidden religious rituals also include private devotional or healing practices, including songs, prayers to religious and non-religious figures such as Santo Niño and Dr. José Rizal, pilgrimages, and actual embraces of a saint’s image for intercession. 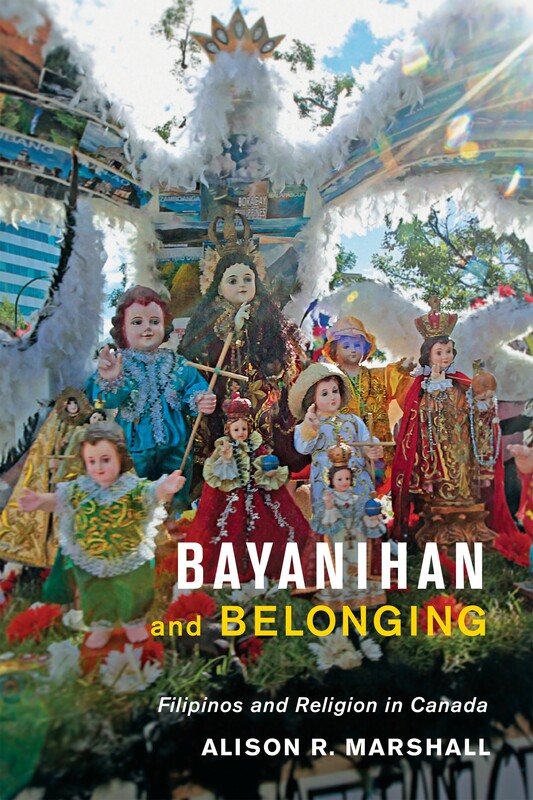 “Bayanihan and Belonging” puts a focus on Winnipeg, which is home to Canada’s oldest and largest Filipino-Canadian community, and showcases current church-based and domestic religious routines of migrant Filipinos. From St. Edward the Confessor Church, the principal site of worship for Filipino Catholics in Manitoba, to home chapels, and healing traditions, Marshall explores the day-to-day celebrations of bayanihan, or communal spirit. Drawing on experiences from Manitoba’s Filipino population, the book reveals that religious practice fulfills not only a need for spiritual guidance but also for community. The book quotes Mike Pagtakhan, a Winnipeg City Councillor and nephew of Dr. Rey Pagtakhan, a former MP who was the first elected Canadian Filipino and who is also featured in the book. Mike explains that so many Filipinos came to Winnipeg because they felt like they belonged, or because of Bayanihan. With a large Filipino-Manitoban population outside of Winnipeg as well, Dr. Marshall wrote an entire chapter on Brandon. Emphasizing local connections with research that is important both locally and worldwide demonstrates the impact that Brandon University faculty make every day, says BU Dean of Arts Dr. Demetres P. Tryphonopoulos. “The movement of people to new places, carrying with them their cultures and religions, is one of the great stories of human history, and this movement is becoming increasingly common as transportation technology eases global migration,” Dr. Tryphonopoulos said. “As Dr. Marshall has previously done with her research into the early Chinese-Canadian community, her current work is an important investigation into the Filipino-Canadian experience that brings a particular focus on Manitoba, on Westman and on Brandon. Early reactions to the book are glowing and sales have been very strong. It is available online at UTorontoPress.com. Now, Dr. Marshall says she is hoping to re-connect with some of the people who were featured in the book so she can share the final work with them. Dr. Marshall can be contacted at 204.727.7322 or MarshallA@BrandonU.CA. Hilary Clapp was one of the first Filipinos to come to Canada. Photo courtesy Trinity College School. 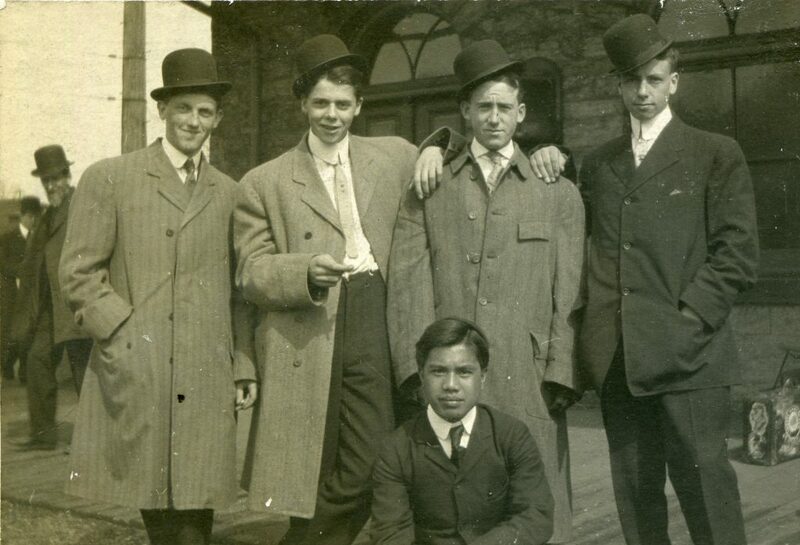 Hilary Pit-a-pit Clapp was an Igorot youth, and his conversion to Christianity marked a turning point in Episcopalian missionary work and also in Canadian history. It is said that prior to Pit-a-pit’s conversion, no Igorot child had been attracted to Christianity. Hilary Clapp was brought to Canada in 1907, a time when many North Americans had come to know the Philippines through the large numbers of Igorots and other Filipinos being paraded as head hunters and dog eaters at international fairs. Pit-a-pit, now known as Hilary Pit-a-pit Clapp, was under the guardianship of Reverend Walter Clapp. Hilary came to Canada in 1907 and was the first Filipino to attend Trinity College School in Port Hope, Ontario. Founded in 1865, the institution was an elite boarding academy patterned after American schools. Almost all the students were “white” Anglicans of European descent. When it was deemed that he was ready to return to the Philippines and Christianize others, Clapp returned to the Philippines in 1910. Image of Bibak dancing at the Manitoba Street Festival 2016. Photo by Phil Hossack. 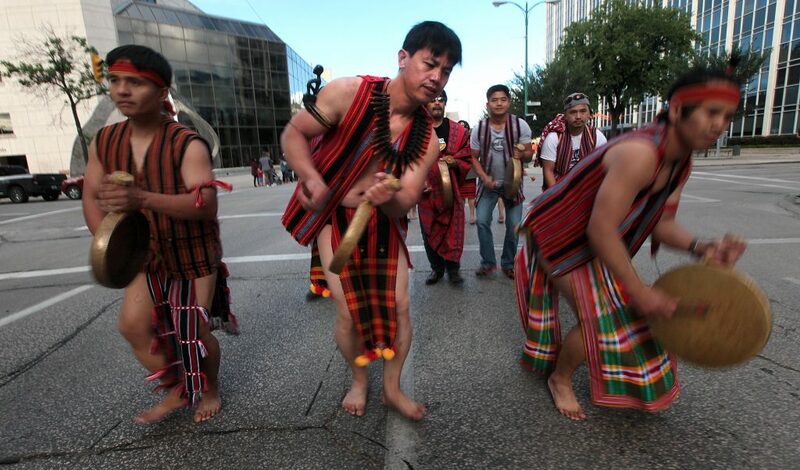 BIBAK is a group that performed Ifugao and Bontoc festival dances at Filipino events in Winnipeg. BIBAK had started in Baguio City (the largest city in the mountainous region) in the 1950s. The acronym BIBAK is a legacy of the American colonial period in the Philippines. Americans introduced the term to define the five major tribes from the Cordilleras, a mountain range in the northern Philippines: Benguet, Ifugao, Bontoc, Apayao, and Kalinga. There are now also BIBAK groups in Toronto, Vancouver, Montreal, Calgary, Edmonton, and throughout the world. One in Regina is being formed. Each year, the BIBAK Association of Manitoba hosts a Cañao (an Igorot festival), at which tribal cultures are celebrated. In the nineteenth and early twentieth centuries, the Cañao provided the inspiration for popular and exploited performances by Igorots at American exhibitions and fairs, as I discussed earlier in the book. 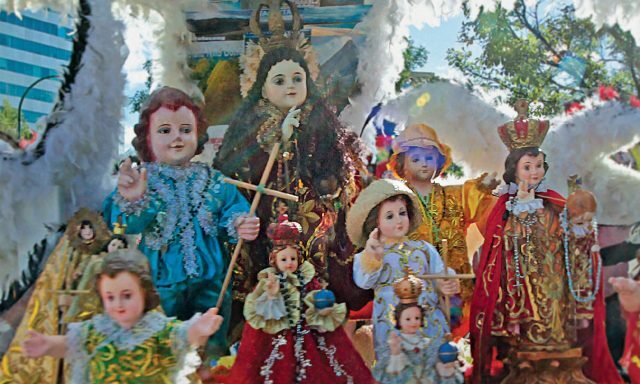 Cañaos today are commonly held in Baguio City to celebrate the culture of the region, and throughout the diaspora.